When the Russian Empire dissolved following the Bolshevik revolution and ensuing civil war, a separate peace was entered into with the Central Powers, a situation which caused consternation among the French and British mired in the trenches of World War I. The Allies agreed that intervention against the Bolsheviks in support of the Russian White Army was essential, to prevent the Bolshevik occupation of strategic ports and to oppose the creation of a communist government in the former Russian Empire. There was also a need to prevent Allied material stockpiles in Murmansk and Arkhangelsk from falling into the hands of the revolutionary Red Army. 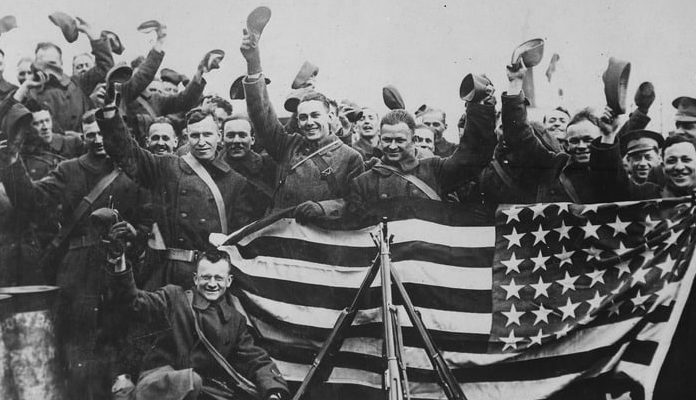 The French and British had few troops to spare after more than three years of bloody warfare on the Western Front, so they turned to the Americans who had recently joined the war. Against the recommendations of his War Department, President Wilson agreed and the United States sent troops and naval units to Russia to support the White army, which was fighting against the Red army in Russia’s civil war. Today the American intervention in Russia during the formative days of what became the Soviet Union is all but forgotten. Here is a list of events of the intervention of the Americans and Allies in the Russian Civil War, which helped lead to long-standing distrust between Russia and the United States. When General Pershing received orders from President Wilson to divert troops from France to Russia, the former responded by re-routing units bound for France to England. There they were placed under British command, armed with Russian weapons, and sent to Arkhangelsk, and ordered to protect the Allied supplies stockpiled there. British commanders in Arkhangelsk discovered upon arrival there that the retreating Red army had moved most of the supplies with them as they withdrew. The Americans were ordered on an offensive against the Red army, to attempt to relieve the Czech Legion which was also heavily engaged against the Red army. Beginning in September, 1918, American troops launched an offensive which lasted more than six weeks against the Red army. As the Americans pushed the Russians back along two fronts, logistics difficulties developed and by the end of October their British commanders ceased offensive operations and established defensive perimeters, with the notorious Russian winter already setting in. The Russians responded with an offensive of their own, and the poorly supplied American troops were gradually pushed back, suffering casualties inflicted by the Russians, the weather, and the Spanish flu as 1918 ended and 1919 began. By the fall of 1919 American casualties in what was by then being called a peacekeeping effort had exceeded 500.